A Grade II listed Georgian townhouse, with flexible accommodation over three floors and with a wealth of period and character features, yet with the convenience of modern day living, and benefiting further from an established and well stocked, southerly aspect rear gardens, approx 170ft. The spacious reception hallway with original staircase provides access to accommodation offered: Sitting room with Ingelnook fireplace and bay window to front aspect, dining room with feature fireplace and bay window, study with wood burning stove and access to the basement, ground floor cloakroom, kitchen/breakfast room with Aga, access through to the light and airy garden room/conservatory, with vaulted ceiling and French doors leading out onto the spacious and sheltered patio. 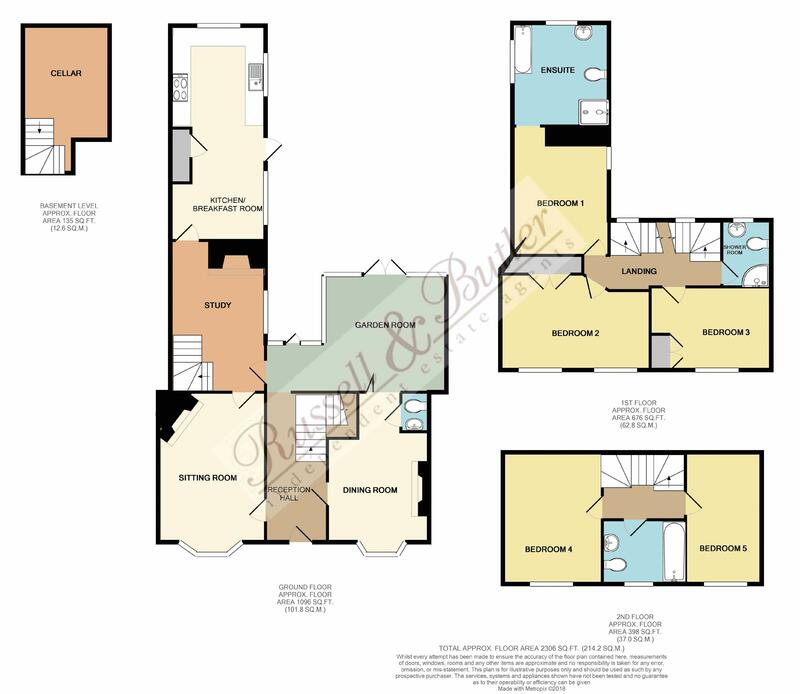 To the first floor, master bedroom with built in wardrobes and en-suite, two further double bedrooms and shower room, staircase leading to the second floor, bedrooms four and five, separate bathroom and kitchenette area. A particular attractive feature of the property, are the well stocked walled rear gardens. No Onward Chain. Spacious hallway with original staircase rising to first floor, radiator, wooden flooring, two wall light points, under stair storage cupboard. With feature Inglenook fireplace, wooden flooring, exposed beams and timbers, bay window to front elevation, two radiators. With feature fireplace, wood flooring, bay window to front elevation, radiator, exposed timbers. With feature fireplace with wood burning stove, wood flooring with access to the basement/cellar, built in book shelving, window to side aspect. A useful storage room with with window and hot water tank. A beautiful room with vaulted glass ceiling and French doors leading onto the sunny patio and rear garden, two radiators, wooden flooring. Fitted to comprise inset sink unit with granite work tops over, a range of wall and base units, tiling to splash areas, Aga range cooker, two burner hob, built in combi oven, integrated fridge and freezer, integrated dishwasher, inset down lighters, tiled flooring, latch door to concealed staircase, cupboard housing 'ideal' gas fired boiler serving both domestic hot water and radiator central heating. Three windows to side aspect, door to patio and rear garden. Stairs rising to second floor, inset down lighters, exposed timbers. White suite of panel bath, separate shower cubicle with shower as fitted, low level W/C, pedestal wash hand basin, half height tongue and groove, chrome ladder/heater towel rail, radiator, window to rear aspect with views down the garden. Exposed timbers, radiator, sash window to front aspect, airing cupboard, storage cupboard. Sash window to front aspect, radiator, inset down lighters, exposed beams. Corner shower cubicle with shower as fitted, low level W/C, pedestal wash hand basin, chrome ladder/heater towel rail, ceramic tiling to splash areas, extractor fan, window to rear aspect, inset down lighters. With Velux window, small kitchenette area (Ideal for guest facilities) inset down lighters, radiator. Original leaded light window to front aspect, radiator, exposed timbers, inset down lighters. White suite of panel bath, low level W/C, pedestal wash hand basin, leaded light window to front aspect, spiral radiator, exposed timbers. The private enclosed rear gardens are a particularly attractive feature of the property with a 'sun trap and sheltered' patio approx 30ft which leads off the garden room and kitchen ideal for entertaining, and then the remainder garden approx 140ft. There are several mature fruit trees, lawn, established flower and shrub beds and trees, ornamental pond, storage shed with light and power, fully enclosed.